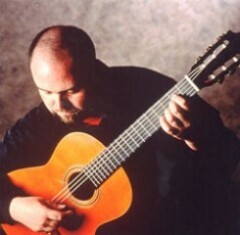 Scott Tennant is a founding member of the the Los Angeles Guitar Quartet, the GRAMMY-winning ensemble composed entirely of alumni of the USC Thornton School of Music, and is himself considered to be one of the world’s top classical guitarists. Scott Tennant is a founding member of the the Los Angeles Guitar Quartet, the GRAMMY-winning ensemble composed entirely of alumni of the USC Thornton School of Music, and is himself considered to be one of the world’s top classical guitarists. During his student years at USC (1980-1986), he studied with Pepe Romero, James Smith and was a chosen performer in the USC Segovia Masterclasses of 1981 and 1986. He has authored several books and articles on guitar technique, including the best-seller Pumping Nylon, which has attained a “cult” classic status. It has become a standard text in conservatory and university guitar programs around the world. Tennant has made numerous recordings as a soloist on the GHA, Delos and GSP labels, and with the LAGQ he has recorded for GHA, Delos, Sony Classical, Windham Hill, Deutsche Grammophon and Telarc labels. Their Telarc release LAGQ Latin was nominated for a Grammy award, and it was their current Telarc title LAGQ’s Guitar Heroes that won a Grammy as the best classical crossover recording of 2005. Tennant is best known for his performances of Spanish music, and his recordings of the music of Joaquín Rodrigo.